I wasn't kidding when I wrote that Meg and I are Pinterest penpals. I've been wanting to make something like this for a long time. Love this scarf. Seriously. Even if you are just learning to use your sewing machine, you should put this one on your weekend crafting list this month! One thing I really love about the seasons changing from summer to autumn, is the wardrobe shift. I really love autumn clothing: sweaters, boots, scarves, wrist warmers, and hats. 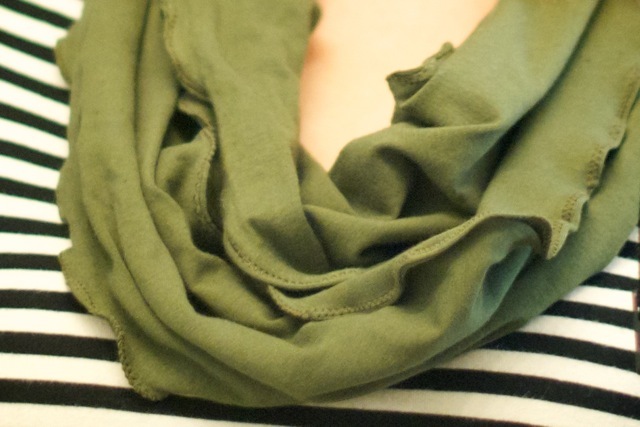 So when I pinned this DIY scarf, I knew I would want to make one (or ten!) to add to my autumn spread. The first time I read through the tutorial, I knew it was a good fit for me. I love to sew. And I am really deeply creative. So basic instructions and rule-breaking are two things that I really loved about the process for making this scarf. I love that I could feel creative control and I could bend rules and explore the process myself. I cut two strips of jersey fabric that I had tucked away in my fabric stash. I don’t use jersey cotton often because I don’t have a serger and am always intimidated with jersey’s stretch. However, with this project, you actually tug on the fabric the whole way through the presser foot on your machine and the act of tugging at it while you sew creates the cute ruffled edge. That was a challenge I could easily take on! I never measured the fabric. I honestly eyeballed it and stretched it to match at the edges while I was sewing. If you need more order than that, feel free to measure and pin. As I was tugging away at the fabric and sewing, I was thinking about how great this type of scarf would be for making many and giving them as gifts. Or making many for myself! I was thinking about the possibility of using a different fabric on top versus on bottom for a fun pattern/print/solid mix. But then I had another idea. I could make one in black or white or gray fabric and I could buy some neon thread. I have been wanting to work the neon trend into my wardrobe in very small doses and this could be a great way to get it! So now I’m planning my next few scarves for the fall. One thing I really love about the jersey cotton is how soft it is. I tend to only wear scarves that are light weight around my neck and super soft and this fabric fits both of those bills. It’s also a great amount of ruffle for me. A touch of ruffle without being too much. Are you a fan of autumn wardrobe pieces? What are your favorite items to bring out with the chill in the air?